Exhibitors: Gheorghe Fărcășiu, Alfred Ipser, Petre Manea, Nicolae Mira, Eusebio Spînu, Florentin Sârbu, Alexandru Nestorescu, Alexandru Isopescu, Vasile Filip, Ilia Iankov, Gabriela Gheorghe. The aim of the exhibition “Dobrudjan Clay” is to bring back to the Bucharest citizens’ attention the tradition of professional ceramics . The events were first organized in the early 70s, at Medgidia / Romania. Masters Costel Badea and Patriciu Mateescu were the artists who triggered,supported and organized this event, entitled Symposium of Monumental Ceramics.These events still used to happen in the 90s under the name of Hamangia International Symposia of Ceramics. They were organized in Constanţa / Romania, being directed by Gheorghe Fărcăşiu.Nowadays, ceramic artist Eusebio Spînu is responsible of the Costel Badea National Ceramic Salon. The group of ceramists from Constanţa invited the Bulgarian ceramic artist Ilia Iankov and the graphic artist Gabriela Gheorghe to exhibit, together with them, at the Galateea Gallery. The 11 exhibitors make us approach a different plastic language having a common denominator: their Dobrudjan clay they mould every day. 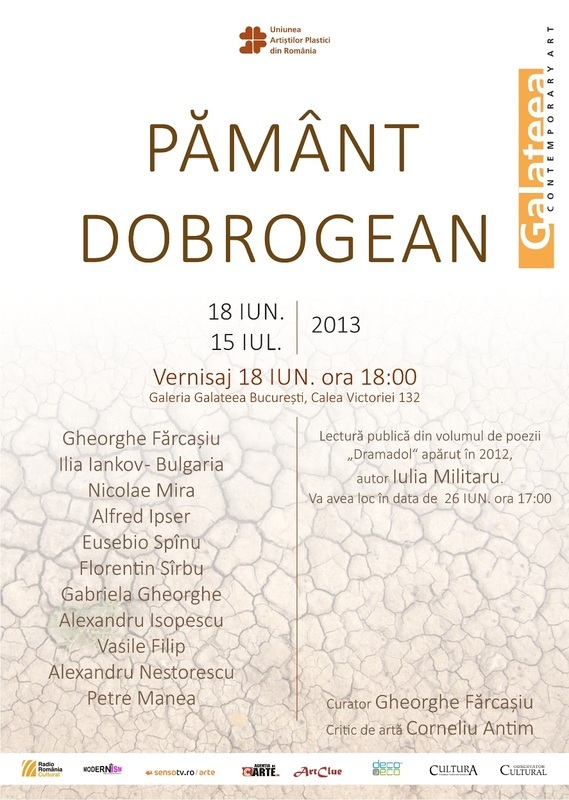 During the Exhibition “Dobrudjan Clay”, visitors are invited to participate in a cultural event. On Wednesday, June 26, at 5 p.m., writer Iulia Militaru will read from Dramadoll, her book of poems issued in 2012 at the Max Blecher Publishing House. The poems read from this volume, combining texts and voices enclosed in drawings, underline the relationship between writing and image, leaving narration proper on the second plane. The story is born at the limit between climatic fragments belonging to different genres or authors. This book, a part of a project achieved by three creators, aims to achieve a dialogue among poetry, graphic art, video, sound and their authors.